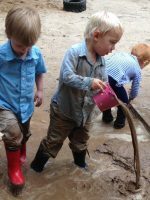 Nestled in the heart of beautiful Charlottesville, Virginia, the outdoor classroom at St. Mark Lutheran Preschool, reflects the school’s philosophy that children learn best through play and that opportunities to explore the natural world are vital to a child’s development. Standing steadfast and proud, mature dogwood, cedar and maple trees line the outskirts of the classroom, offering beauty through the changing of the seasons and shelter from the heat of summer. St. Mark Lutheran Preschool, a ministry of St. Mark Lutheran Church, is well known for their sand “pile.” Nearly one third of the classroom is covered by sand and resembles a beach. Within the sand area you’ll find the hammocks, mud kitchen, dig site and a loose parts building and construction zone. Just like at the beach, the children enjoy digging big holes, building structures and cooking up sandy pies and birthday cakes! The dig site, adjacent to the sand pile, provides just the right spot for big digging and construction vehicles. The center of the classroom, a wide-open space, gives children plenty of room to run, jump and play. 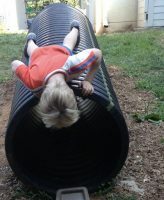 Recycled drainage “tubes” are used for sliding, climbing and crawling. 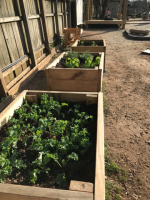 The outer edges of the classroom are home to The Art Garden, The Music Garden, The Magnetic Board, The Gathering Place (stage), raised beds for gardening and a quiet spot for looking at books or playing with fairy houses. 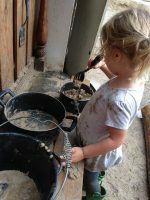 Our journey to become a certified Nature Explore Outdoor Classroom began in the fall of 2014 when, as a new program, we made the decision that providing time and space for outdoor play and exploration is crucial for a young child’s wellbeing and would, therefore, be a cornerstone of our philosophy. The Nature Explore process laid the groundwork for our journey and provided a framework for growth. We’re extremely grateful to our families and friends for their support and gifts of time, talent and treasure. Thank you to the parents, grandparents, alumni, parishioners, and members of our community that have generously contributed to the outdoor classroom fund. You’ve been unwavering in your support of our desire to provide opportunities to play in the rain, jump in the mud and discover the magic of the natural world around us. 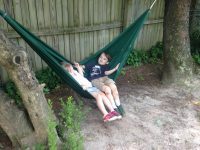 A special gift from the Schreek family of St. Mark Lutheran Church, jump-started the project with the funding we needed to reimagine the space and begin restructuring the landscape to support and encourage natural play. 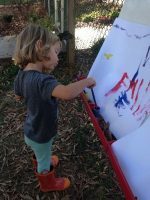 We’d like to thank the Schreek family for their generous donation and for supporting our efforts to provide a beautiful, natural space for children to play, learn and grow. We’d also like to thank Bryce Powell for his help with design; Kevin Brookman of Touch of Earth Landscaping, for believing in our dream and supporting our efforts by generously discounting both labor and materials; Erich Henschel for your wisdom and willingness to go above and beyond; Ryan Melton for building the gathering area and Jules Tatum for literally putting it all together. To all of you who believed in our dream and came to dig, plant, move, muck, shovel, rake, build, cut, hammer and construct – thank you. We couldn’t have done it without you! To the members of St. Mark Lutheran Church, thank you for your unwavering support and for dreaming with us! 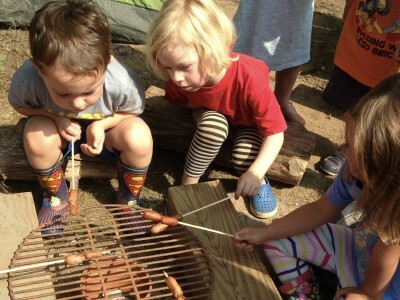 We believe that the days of childhood are precious and should be filled with opportunities for discovery and wonder. 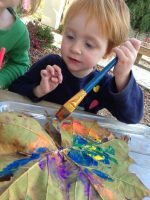 We agree: The best place to wonder and discover is outside!